LOOKING TO SPOOK YOUR SATURDAY? 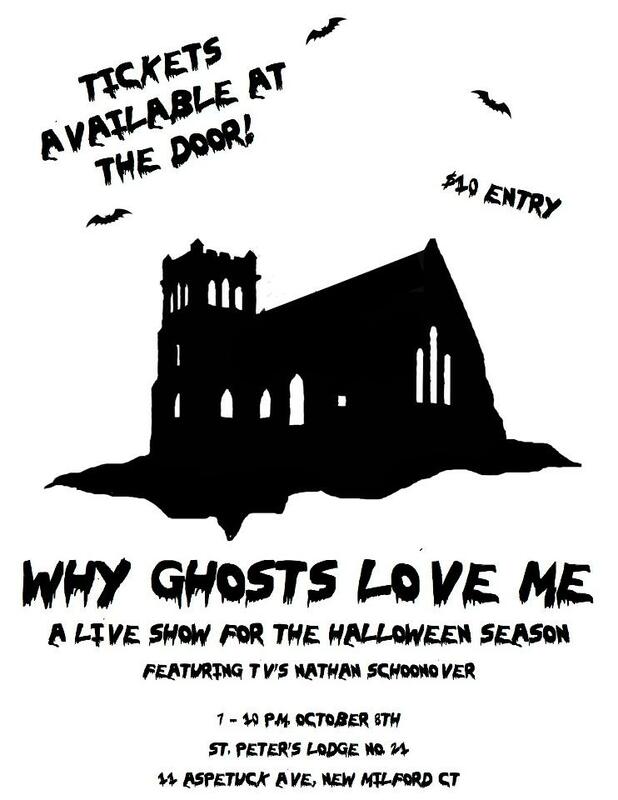 TONIGHT: WHY GHOSTS LOVE ME! TONIGHT: Why Ghosts Love Me at 7 p.m. at St. Peter’s Masonic Lodge #21 inNew Milford,Connecticut! Join me and host Nathan Schoonover of A&E’s Extreme Paranormal, Travel Channel’s Paranormal Challenge and The Ghostman & Demon Hunter Show for spooky stories and Halloween fun. The presentation will include ghostly stories and paranormal evidence with guest speakers Nicole Hall and Angel Ortiz of Connecticut Soul Seekers, Terri J Garofalo of Entities-R-Us, Donna Parish-Bischoff of Indy Paranormal and Frank Todaro of The Invisible World Radio. I will be there signing copies of my book, Skeletons in the Swimmin’ Hole—Tales from Haunted Disney World, and selling some other goodies–and I’ll be joined by writer Stacey Longo, who will also be selling copies of her work–if you want a spooky anthology for Halloween, get it here! Refreshments will also be available. Proceeds from all sales and admission will go toward upkeep of the historical St. Peter’s Lodge in New Milford, Connecticut. The event takes place from 7 p.m. – 10 p.m. Saturday, October 8, at St. Peter’s Lodge #21 at11 Aspetuck Avenue in New Milford, CT. Tickets sold at the door. Last year’s event sold out, so get there early! Admission: Adults $10, Seniors $8, and Kids 10 and Under, $7. Posted on October 8, 2011, in News, Skeletons in the Swimmin' Hole -- Tales from Haunted Disney World and tagged EVPs, Ghost events in New Milford CT, Halloween events, Masonic Lodge New Milford, Nathan Schoonover. Bookmark the permalink. 2 Comments. Yes, it IS! And a rather crazy one around here. I’ve been running around like a nut. But…it’s also my favorite time of year. Hey, autumn is never boring!